Super Easy Crispy Baked Tofu! This Asian-inspired plant-based, egg-free, dairy-free and nut-free Super Easy Crispy Baked Tofu can be made gluten-free if tamari sauce is used instead of soy sauce. Enjoy the baked crispy tofu pieces hot from the oven as an appetizer, side dish, in stir-fry dishes, or add them to work lunches, school lunch boxes, salads, kebabs, noodle dishes or buddha bowls. 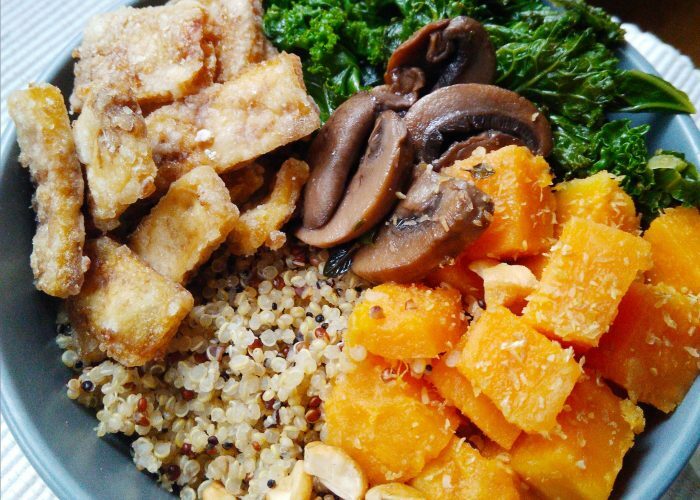 Pictured here is a dinner bowl brimming with plant-powered goodness – sauteed kale, pan-fried mushrooms, sweet potatoes sprinkled with ground flaxseed, crispy baked tofu pieces and a handful of roasted cashew nuts on top of a bed of tri-colored quinoa. Dinner is served! These tofu pieces will keep well through the week so make a large quantity at one go. You can also freeze some in a freezer safe container for later. I consider this a fast recipe because it doesn’t require much food prep and is quick to put together with minimal ingredients. You can also save precious time in the kitchen by finishing up the rest of your dinner prep while the tofu is ‘pressing’ and baking in the oven. A super easy Asian-inspired vegan, egg-free, dairy-free, nut-free (and possibly gluten-free) recipe to make baked crispy tofu that will become a frequent family favorite! Move one of the oven racks to the top part of the oven. Preheat the oven to 400 degrees F (200 degrees C). Use the palm of your hands to briefly and gently press the block of tofu over a bowl to get rid of some initial excess liquid (without crumbling it). Then place this block of tofu between 3 pieces of paper towel (or use a clean kitchen towel) on a plate. Place a heavy plate over the top of the tofu block. Let the tofu be pressed for at least 15 minutes, changing out the paper towels when they are soaked through (about every 5 minutes) to fresh dry ones. At the end, the final paper towels used for pressing should be only slightly damp because most of the moisture have already been pressed out. Meanwhile, prepare the tofu sauce by mixing the soy sauce (or tamari sauce) and sesame oil in a small bowl. After the tofu block has been pressed, slice the tofu into 1 inch x 2 inch (and ½ inch in thickness) rectangular slices. Directly drizzle on the tofu sauce over the cut tofu slices on the chopping board. Here is an alternate method if you want to ensure all the tofu pieces are evenly coated: Place the tofu slices as a single layer on one or two plates, and use a teaspoon to drizzle on half the sauce on the tofu pieces so that all the pieces get a bit of the sauce on them. Then flip the tofu pieces over and drizzle on the remaining half of the sauce to coat the other side of the tofu pieces. Sprinkle 2 tablespoons of cornstarch evenly in a large plastic container to cover the bottom of the container. Cover the container with its lid tightly and shake the container 2-3 times so that the sides of the container get coated with the cornstarch. Place the tofu pieces into the container and sprinkle on the remaining 2 tablespoons of cornstarch. Then replace the container lid tightly and shake the container a few times so that all the tofu pieces get coated with the corn starch. Don’t worry if a few tofu pieces get broken up in this process. Place these slices in a single layer on a cookie sheet (lined with parchment paper). Bake in the oven on the top rack for 10 minutes on each side (flip once). Remove from the oven once crispy and let cool. Ready to serve! Bake to your desired level of crispiness. Note that the 'dryer' the tofu pieces are (after being pressed), the quicker they will turn crispy when baked in the oven. If a saltier version is desired, you can add an extra half teaspoon of soy sauce or tamari sauce to the mixture for a total of 4 teaspoons of soy sauce (or tamari sauce). You may add a tablespoon or two more of cornstarch if you feel most of the cornstarch previously added has been soaked up by the tofu pieces, and some of the tofu pieces still appear ‘wet’ after you have shaken the closed container a few times.